You have to learn to focus and pace yourself to get into the zone. When a marathon runner begins to experience a challenge it is because they are focusing on someone or something outside of themselves. 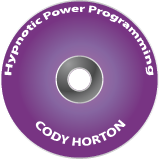 This hypnotic power program will have you focus on getting into the zone to break through barriers.